Is Edamame Bad for You? Scary Facts You Need to Know before Eating it! There are many kinds of green vegetables in the market. Whenever the doctor advise a person to take up green vegetables people usually think only of cucumber and string beans and some leafy vegetable forms. Among these green vegetables there is this one so-called Edamame. Edamame is a young soybean harvested before the beans had a chance to harden. This is usually found in the cuisines in China, Japan, Korea and Hawaii. And you can buy them shelled or in the pod, fresh or frozen. It is usually harvested by hand and some people prefer it steamed with salt. This makes it more preferable to eat as its health benefits are also what humans need. Edamame is a gluten-free and low calorie bean that contains no amount of cholesterol and is an excellent source of vitamins needed in the body such as protein, iron and calcium. We have been taught that consuming fruits and vegetables of all kinds can bring about a healthy well-being. In addition to this, edamame has proven itself through many studies that increasing its consumption can decrease the risk of obesity and overall mortality, diabetes, heart disease and promotes a healthy complexion and hair, increased energy, overall lower weight. Edamame has shown through various studies that it has a lot of health benefits. In fact, it contains phytoestrogens, that has been proven to decrease risk for osteoporosis, while the calcium and magnesium in soy may help to lessen PMS symptoms, regulate blood sugar and prevent migraine headaches. Soy-food consumption has been associated with a lower risk of several specific age and lifestyle-related conditions and improving overall general health. This should be introduced to many to take advantage of. Although a lot of plants are definitely safe to eat even when it is raw, soybeans specifically the edamame aren’t one of them because some of its components that are found in raw soybeans may cause a person as little as short-term digestive problems and as much as long-term health issues. Because of these reasons it is highly suggested if not imposed that it should be cooked or fermented because it neutralizes some of the negative side effects raw soybeans could cause on a person’s health. Today, there is a so-called GMO or Genetically Modified soybean. This is a soybean that has its DNA introduced into genetic engineering techniques. This technique was introduced by Monsanto although not all soybeans have undergone GMO, this technique may be harmful to consumers. In countries where foods are not corrupted by GMO, eating edamame occasionally should not be a problem, but still practice moderation! The only toxic substance that releases intentionally into our environment to kill specific living things is pesticides. This includes substances that kill weeds (herbicides), insects (insecticides), fungus (fungicides), rodents (rodenticides), and others. The use of these pesticides has been a norm already not only to farmers but also in homes, parks, schools, buildings, forests, and roads. It is basically found almost everywhere. Because of the use of these toxic pesticides these chemicals are already found also in the air we breathe, the food we eat and the water we drink. Some of the farmers who has a vast area that harvests this so-called edamame use these pesticides to help them get rid of pests that harms their crops. 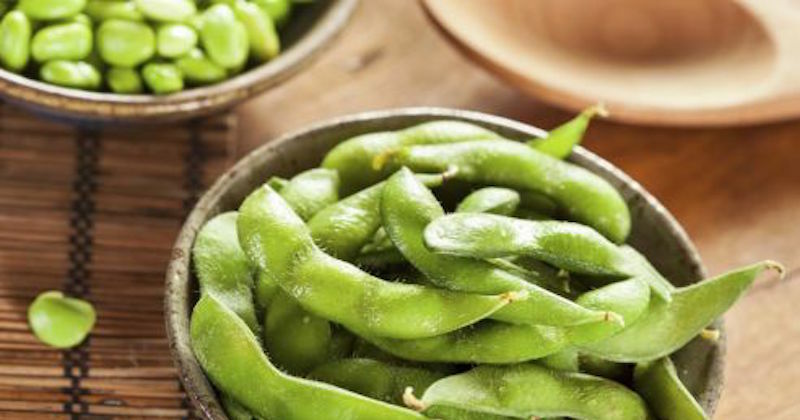 According to studies, edamame contains isoflavones that can inhibit estrogen receptors in the body that disrupts the body’s natural estrogen function. Studies have shown that soy isoflavones could cause breast cancer. It can significantly increase in proliferation of the epithelial cells in human breasts that may turn cancerous. There were other studies to show that soy is an endocrine disruptor and may be harmful for women who are pregnant, plan on becoming pregnant, or are nursing. Edamame in moderation once in a while, sprinkled in your salads could probably be fine. But, recently, it has become a trend where it’s being sold in big bags as snacks. People are beginning to eat edamame by the bags, assuming that it’s green and healthy. Based on that one fact that soy could be an endocrine disruptor, makes edamame not a choice food to be eaten as a “healthy snack”. No need to throw out those frozen edamame you have in your freezer, eat them sparingly, but start looking for other more healthful snacks. Hernandez Walker is the founder of Juicerly.com, a site that is dedicated to studying the best juicers specifically made for certain types of consumers. His goal and mission is to help prospect buyers know the best type for them. He also advocates a healthy lifestyle in this new generation to open up to a healthy future.